Showing a new work at the Istanbul Design Biennial. Islam, Republic, Neoliberalism comprises of three network maps where mosques, republican monuments/ museums and shopping centers dispersed throughout Istanbul connect to each other within their areas of influence. 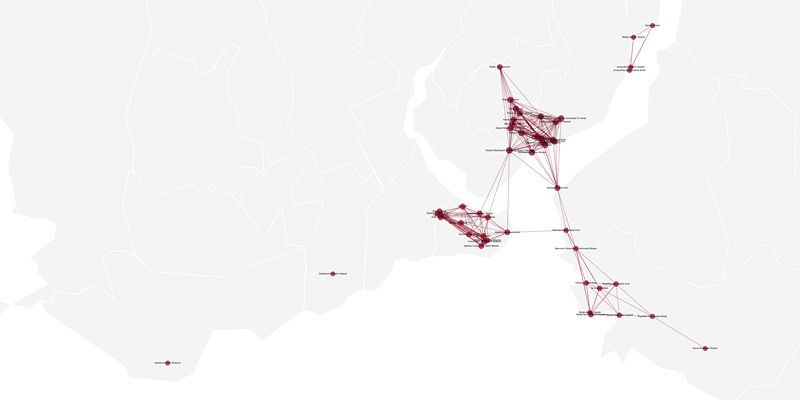 These maps present a comparative display of network patterns that are formed through associations linking those architectural structures that represent the three dominant ideologies –Islam, Republic, Neoliberalism– in Turkey. Scroll down for the catalogue text. 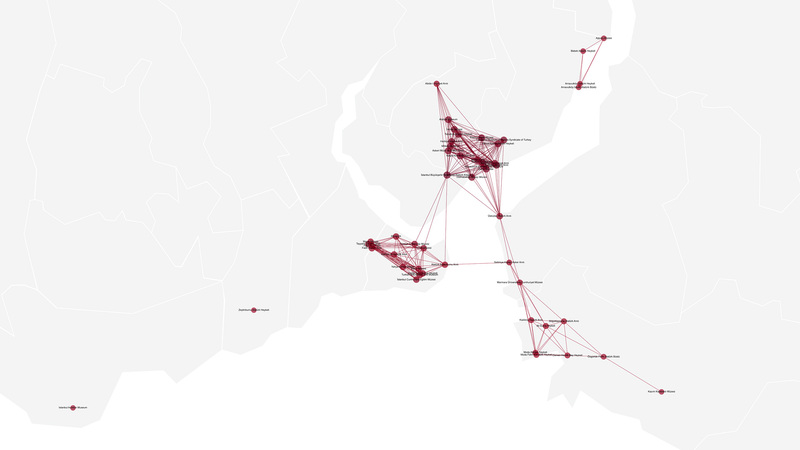 Network of Mosques connected through overlapping call to prayer sounds of 3000+ mosques in Istanbul (image below is an excerpt, click on the image to enlarge). 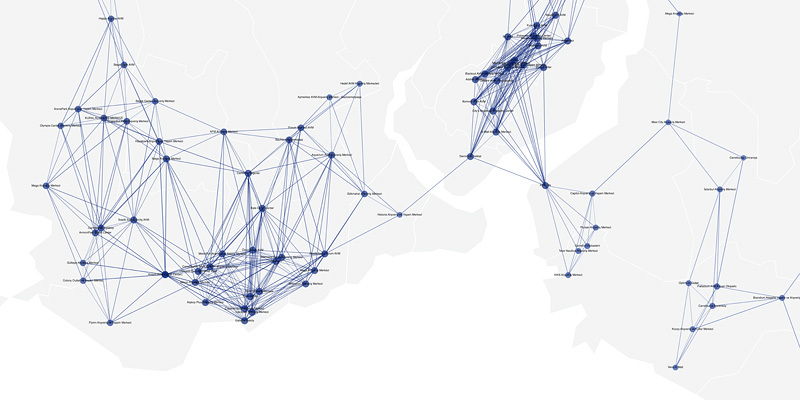 Network of Republic Monuments connected through physical proximity of the republic monuments/museums in Istanbul (image below is an excerpt, click on the image to enlarge). 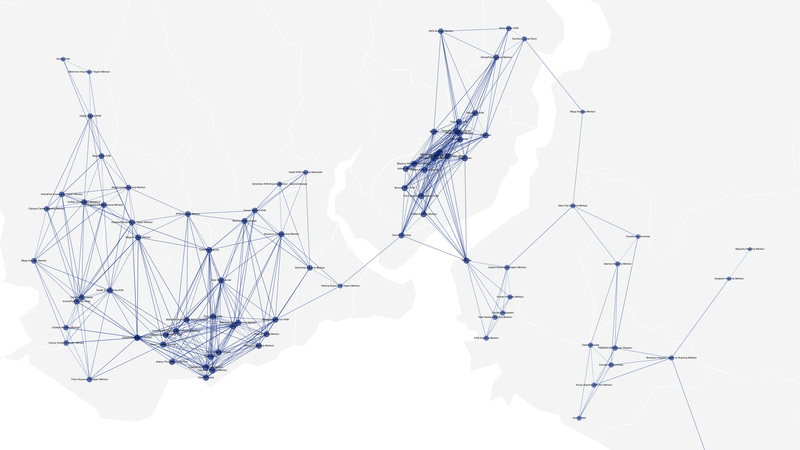 Network of Shopping Malls connected through overlapping range of reach of the shopping malls in Istanbul (image below is an excerpt, click on the image to enlarge). Mosques, the monuments and museums of the republic, and shopping malls… These constructions are physical spaces that surround us through the axis of contemporary Turkey and the city; that signal us where we are, where we were born, what to value and believe in, what to appreciate and who we are as agents; that constantly invite us to articulate with and experience them. Even if we do not engage in every urban space in the city, we encounter invitations that we cannot dismiss. As the republican monuments that rise in every square and the museums of the republic that frequently come in our way remind us the concept of nation and keep a certain rhetoric alive, monumental shopping malls invite us to become relentless consumers. And we encounter the mosques, perhaps most frequently. With their highly familiar forms and by triggering our audial and visual senses, they somewhat remind us how strong and deeply rooted they are. Beyond their functional and physical value and as symbols of the ideologies that they sustain, these constructions remind us their existence and power within our urban life in various ways and remain eternal and fresh in our daily lives. Despite the fact that their reflections in urban architecture are relatively humble and low-paced, changing equations are echoing in the city as a consequence of the nature of ideologies. Even though physical spaces do not flex and bend easily, different meanings are being attributed to the same constructions, selective perceptions of the agents are changing, or certain constructions can simply be abandoned. Simultaneously, new symbolic spaces are being constructed and they rise as the definitions of new entities of meaning. Given this context, Islam Republic Neoliberalism targets three fundamental ideologies that are most resilient and powerful in contemporary Turkey. The demonstration of physical relationships that these physical constructions establish with each other, via a network diagram, reveals a more powerful line of argument than simply designing a geographical map. Going beyond their quantity and the frequency of their salutations to the agents of the city, it renders the spatial power and network pattern of these ideologies susceptible to analysis.